Our own Dr. Kevin Wepasnick guided a Chemical & Engineering News (C&EN) investigation of the properties of a helium-pressurized beer in an article entitled Helium Beer, From Prank to Tank in its 2 November 2015 issue written by Craig Bettenhausen. C&EN is a publication of the American Chemical Society. 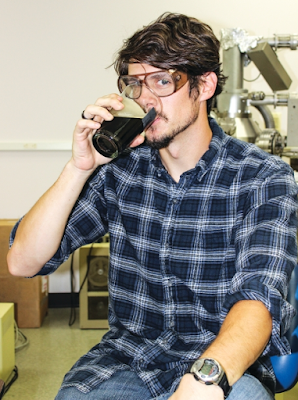 Kevin brewed a 5-gallon batch of a cream stout beer for C&EN over a two-week fermentation period at Anderson Materials Evaluation, Inc. with writers from C&EN visiting our laboratory at the start and the end of the process. He used a kegging process, but instead of pressurizing the keg with carbon dioxide, he pressurized it with helium. The experiment was set up to test the claims that drinking a helium-pressurized beer would cause the drinker to speak with a high-pitched voice, as demonstrated in some on-line videos. Well, yes, thinking as a scientist, the more than a thousand times lower solubility of inert helium compared to the highly polar carbon dioxide molecule, told us those videos were faked prior to doing the experiment. Nonetheless, the experiment was fun for all.